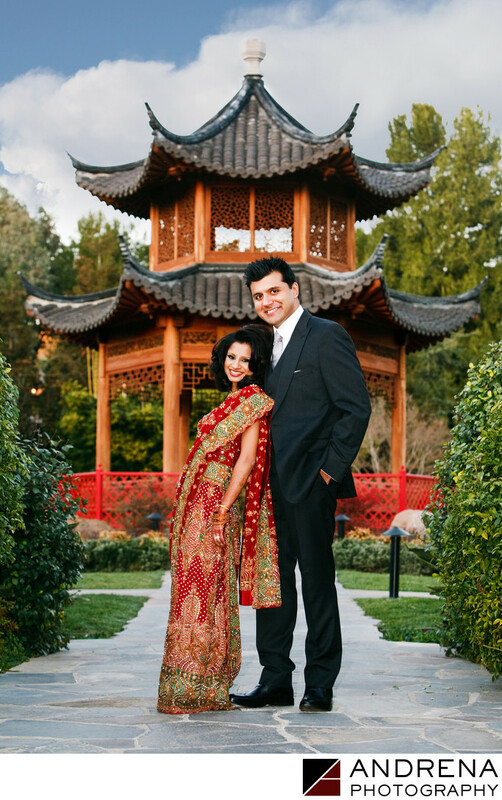 The pagoda on the far side of the Four Seasons Westlake Village is a favorite spot for portraits. Unfortunately, it is often in half sun and half shade when the bride and groom have time to walk to that side of the property. I thus felt lucky at this Indian wedding when I found that cloud cover had created beautiful, even lighting on the pagoda, thus enabling me to create the portrait my clients were hoping for. The height different between the bride and groom was around 16 inches, so posing them was a really fun challenge. But for this photograph, I just had them stand, and let their height difference shine. I love how the bride is leaning her head on her fiance's chest because this creates a sense of intimacy that standing apart could not have created. South Indian wedding photographed at the Four Seasons Westlake Village in Westlake Village, California.